Face capillaries, vein and age spot treatment with our state-of-the-art Cutera Excel V™ laser can do wonders to give you a more even skin tone and give your complexion a youthful and beautiful appearance. Leg spider vein treatment at our Saratoga Springs- and Albany-area Medical Spa entails using laser and sclerotherapy to provide you with more even leg skin tone- treating visible blue veins. Neck and face capillaries like telangiectasias, rosacea, and dark spots which are hard to cover up with cosmetics can also be treated. Please contact our Saratoga Springs plastic surgery to schedule a consultation for vein, capillary and age spot treatment. The Excel V™ Vascular Laser System is the latest state-of-the-art “gold standard” safe and effective treatment for a variety of vascular skin conditions such as rosacea, facial capillaries, spider veins, age spots, reddish scars, red stretch marks, and cherry angiomas. It can be used to treat any skin type – from very light to very dark. Pigmented lesions are light tan to brown and black areas of discoloration caused by increased pigment collection. Age spots, liver spots, freckles and brown birthmarks can be treated. The Excel V™ uses a non-invasive high power green laser light, which is absorbed by abnormal blood vessels located just beneath your skin’s surface or age spots on the surface of your skin. Unlike older style laser treatments which burst the blood vessels causing bruising, the Excel V™ treated vessels collapse, are sealed shut, and are absorbed by your body. The lack of bruising reduces down time. The laser light heats and removes the age spots and reduces abnormal blood vessels, which cause undesirable red or purple spots on your skin. The Excel V™ laser utilizes a unique cooling system for pain control which avoids the need for anesthetic injections or topical anesthesia, maximizing your comfort. The laser is adjusted to match the specific skin condition being treated. This customization not only provides greater precision, but greater effectiveness also means fewer treatments may be required. The treatment sessions generally last 10-30 minutes, but can vary depending on the size of the area being treated. The amount of treatment sessions required will also vary, depending on your condition, but many patients see results after only one treatment. After treatment you can expect little or no downtime or disruption to your daily routine and no long-term side effects. Treated age spots often temporarily darken and then flake off within a few weeks revealing pinker skin beneath. *It may take a few weeks to see the final result. Touch-up treatments may be desired to obtain the best possible result. For treating larger spider veins on the legs a fine needle is used to deliver a sclerosing agent that causes the veins to become irritated, collapse, and be absorbed by your body. Several treatments may be needed to reach a plateau. About 60% of women are genetically prone to getting spider veins. It is not unusual to have these recur and retreatment in future years is common. Vascular lesions are areas of overgrown or enlarged blood vessels. These vary in color from red to purple and range in size from a spot to larger areas of the face and body. Visible purplish veins are commonly seen on the legs and face. Red capillaries called telangiectasias are often seen on the face, base of the nostrils and cheeks and are difficult to cover up with cosmetics. These lesions may be seen at birth or are acquired during your life through overexposure to sun, as a result of hormone or contraceptive use or the natural process of aging. Scars and stretch marks can also have reddish discoloration that can be effectively treated with the Excel V™ laser. Pigmented lesions are light tan to brown and black areas of discolorations of the skin of your face and body. These are known as age spots, liver spots, freckles and brown birthmarks. These are seen at birth or acquired through overexposure to sun or the process of aging. Be sure to have these examined by your regular doctor or our board-certified plastic surgeon, Dr. Steven Yarinsky, to be certain that they are not suspicious for melanoma- a form of skin cancer. 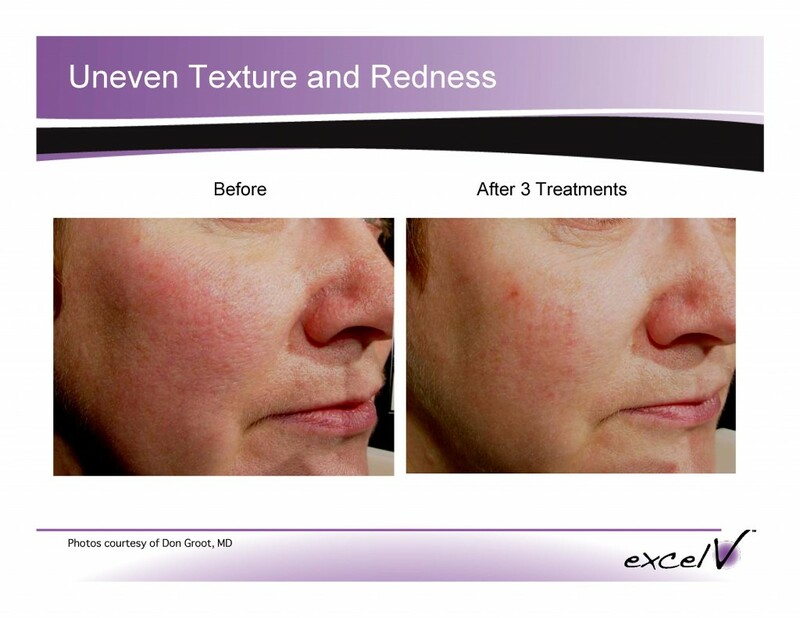 Benign (not cancerous) pigmented lesions can be effectively treated with the Excel V™ laser. You have visible blood vessels on your face that are difficult or impossible to cover with cosmetics such as those located at the base or sidewalls of your nose. You have brown or darkly pigmented “age spots”, liver spots, freckles or brown birthmarks on your face, hands, arm or legs. Sclerotherapy is the “gold standard” for treating small leg veins. Using magnification a small amount of a sclerosing solution is injected into your spider veins using a tiny needle. The vein walls collapse and your body absorbs the vein. Our new Excel V™ Laser is excellent for treating and minimizing smaller leg spider veins that cannot be treated with sclerotherapy. Face veins and telangectasias (red capillaries), such as those located around your nose, and brown/red age spots on your body and face are also effectively treated with the Excel V™. 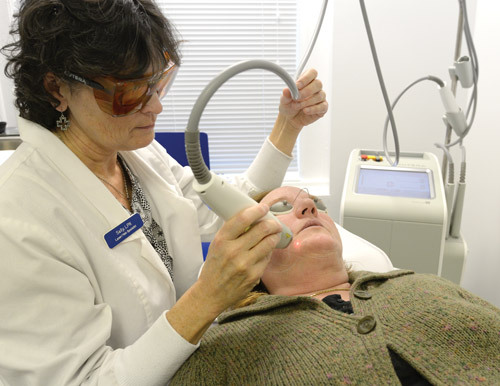 The Excel V™ Laser is also used to treat vascular conditions that cause redness of the skin. Treatable conditions include red scars, bruises and red stretch marks. The targeted area is treated with the non-invasive laser light, which eliminates the abnormal visible blood vessels by causing them to collapse and be absorbed by your body. With the vessels gone, the treated area returns to the natural color of the surrounding skin. The procedures are done at Dr. Yarinsky’s office by a trained nurse. Sedation is not usually required since the procedures are nearly painless. The Excel V™ provides skin cooling during the laser treatment for comfort. Sometimes an anesthetic cream is applied to the skin before the procedure to help relieve discomfort during the procedure. There is usually no pain after the treatment. Cost of Sclerotherapy and Excel V™ laser treatments depends on the size of the area treated and the condition being treated. Talk with Dr. Yarinsky and his nurses in consultation for a list of the fees. Facial capillaries and age spots may be eradicated after a single Excel V™ laser treatment but touch-ups are not unusual to reach a result “plateau”. *The results are seen within 2-6 weeks after the single treatment. Depending on the condition being treated, additional treatments may be desired to obtain the best result. The result of sclerotherapy (vein injections) is seen in 10 to 14 days or sooner. Several treatments are usually needed to reach a “plateau” and touch up treatments every 6-12 months are often desired for leg vein treatment. Excel V™ treatment of face capillaries and age spots rarely cause bruising. Bruising usually persists in the area treated by sclerotherapy (leg vein injections) for a week. Leg vein laser treatment may cause brownish discoloration which may take a few months to resolve. Support hose must be worn for a week after leg spider vein treatment. The specific risks and the suitability of these procedures for you can be determined only at the time of your consultation with Dr. Yarinsky. All procedures have some degree of risk. Minor complications that do not affect the outcome occur occasionally. Major complications are unusual. *Most people are very happy with the results but no specific result can be guaranteed. These procedures are done at our Joint Commission accredited office facility. 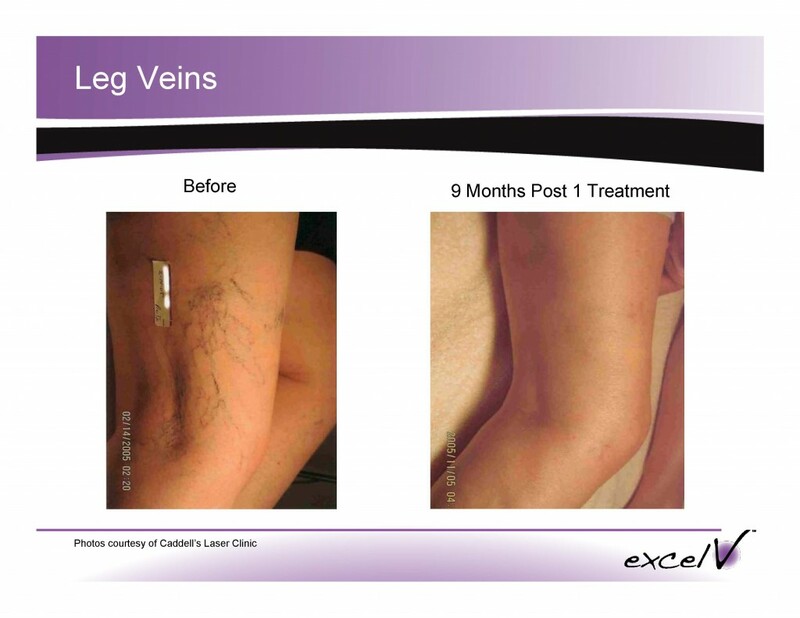 If you would like to learn how Excel V™ laser treatment can help improve your skin and how sclerotherapy can improve your spider veins, please contact us today for your consultation with Dr. Yarinsky.